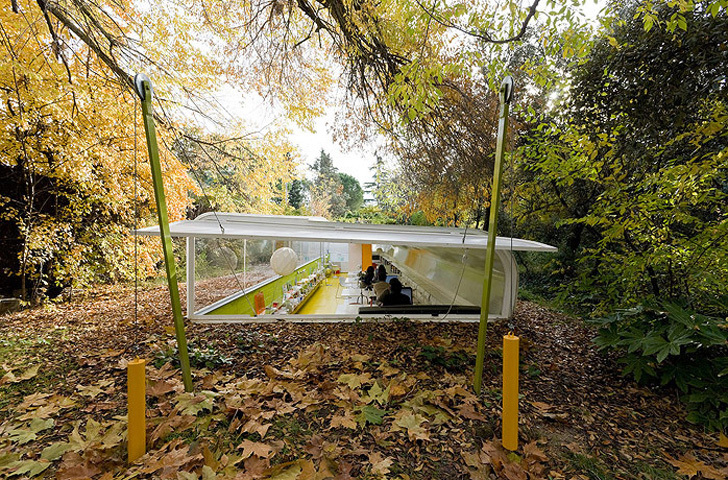 <a href="https://inhabitat.com/spanish-city-offers-lifetime-tram-passes-in-exchange-for-cars/" target="_blank">Spanish</a> architecture firm Selgas Cano designed and built this incredible sunken office, which gives their employees a unique bug’s eye view of the colorful forest around them. Situated in <a href="https://inhabitat.com/museo-abc-transforms-a-madrid-factory-with-glittering-mosaic-facade/" target="_blank">Madrid</a>, the streamlined space is encapsulated by a curving glass wall that provides gorgeous views of the surrounding forest while completely eliminating the need for artificial lighting during the day. Read on for a look inside! 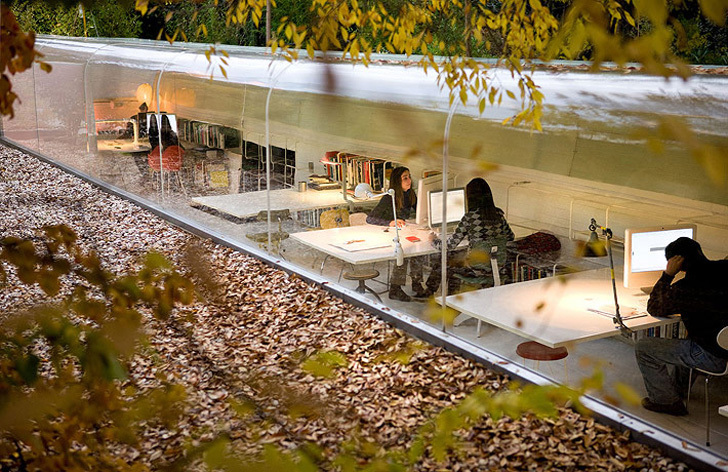 The office takes the form of an <a href="https://inhabitat.com/pas-skate-house-an-eco-home-where-you-can-skateboard-on-any-surface/" target="_blank">aerodynamic tube</a>, with a long window on one wall that extends into part of the ceiling. Acting as both a window and a skylight, the glass wall floods the office with light, eliminating the need for artificial lighting during the day. 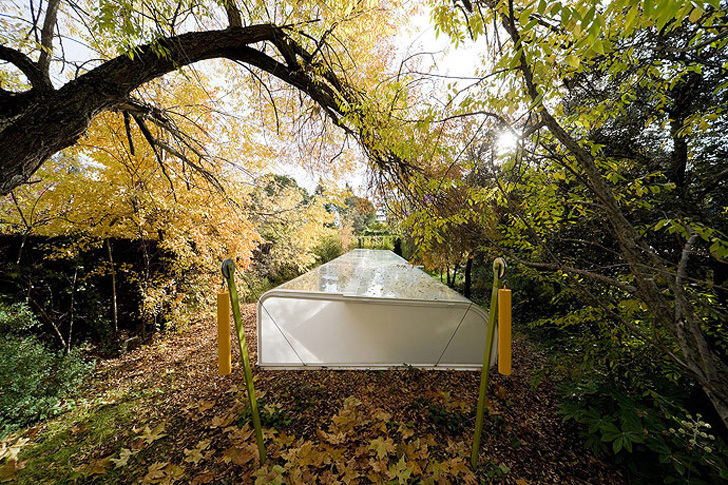 The window is lined with the employee’s desks, giving them an eye-level view of the forest floor. Falling leaves, animals, and wildlife pass by, creating a shifting forest landscape that changes throughout the day. Employees can also look up into the tree boughs and sky through the curved part of the glass casing. Half of the building is <a href="https://inhabitat.com/partially-submerged-sports-complex-in-madrid-emulates-surrounding-foliage/" target="_blank">submerged into the earth</a>, which provides an excellent degree of insulation. During Madrid's hot summers, the <a href="https://inhabitat.com/mexicos-subterranean-childrens-museum-is-an-interactive-and-educational-immersion/" target="_blank">building</a> keep Selgas Cano’s employees cool naturally, with little need for air conditioning. A stone staircase leads down into the office, which has sturdy lower walls of brick. Shared desks line the bunker, which glows with spherical lanterns and desk lamps when illuminated at night. The extraordinary <a href="https://inhabitat.com/a-crop-of-living-green-offices-create-breathing-space-in-downtown-denver/" target="_blank">office</a> has been met with mixed reviews, but we find the unique proximity to nature to be both cozy and inspiring! 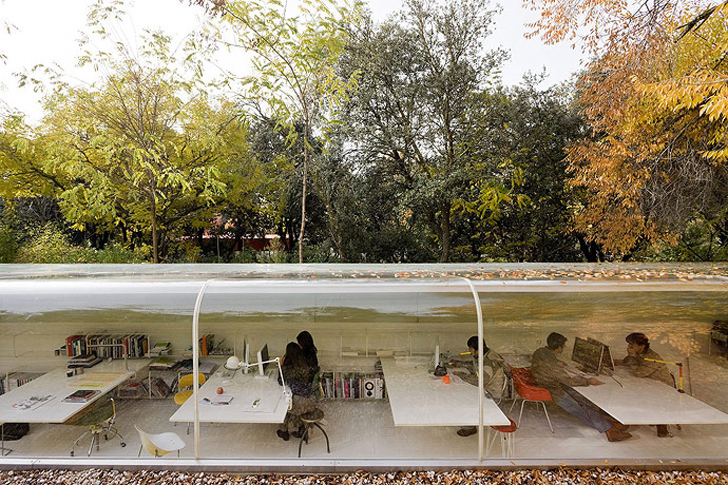 The innovative office was beautifully photographed by <a href="http://www.iwan.com/iwan_index.php" target="_blank">Iwan Baan</a>. 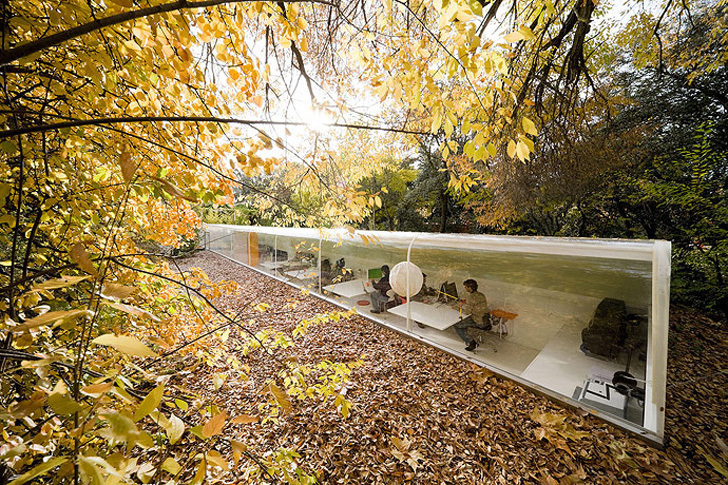 Spanish architecture firm Selgas Cano designed and built this incredible sunken office, which gives their employees a unique bug’s eye view of the colorful forest around them. 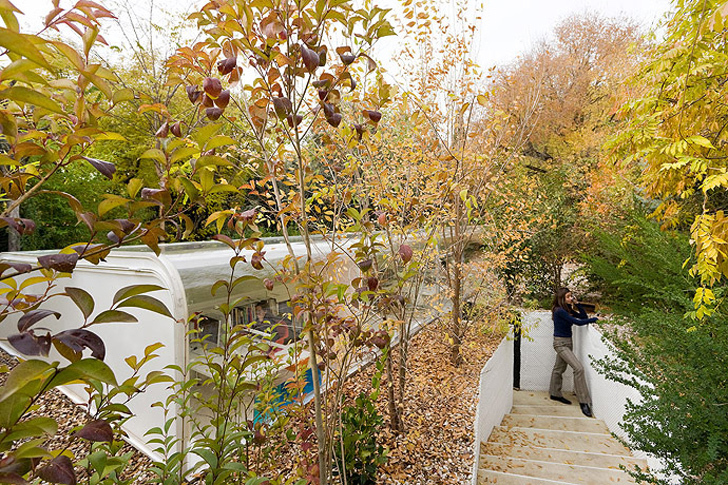 Situated in Madrid, the streamlined space is encapsulated by a curving glass wall that provides gorgeous views of the surrounding forest while completely eliminating the need for artificial lighting during the day. Read on for a look inside!